I was born in New Plymouth, New Zealand and started running competitively at the age of 15 when I found out I could get the day off school if I ran cross country. My first love will always be racing on the track. Over the years, I moved around from the 3,000m to the 10,000m. In 2005, I started moving up to the marathon distance. While I loved the training, I never really managed to put the race together that my track times suggested I was capable of. In 2010, I retired from the sport and got a real job. This didn’t last long. A few years later, I started looking to the trails for a new challenge. For the past few years, I’ve run a wide range of races and continue to learn. 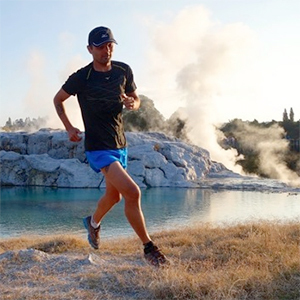 I’ve been lucky to be able to work with the international running brand, Mizuno to market their new trail shoes. As long as I’m enjoying running, I’ll keep getting out the door. Movies, large popcorn re-fills, Swedish fish and hot wings. Skateboarding, snowboarding, dogs, design and music. No flavor fatigue! While other brand gel flavors get tiresome, VFuel always tastes great, even late in a race. Walking in the Olympic opening ceremonies. 12 x National NCAA Division II Champion in Track & Field and Cross Country.